ATN NVBNB05X30 NVB5X-3 Night Vision Binocular FREE SHIPPING! See in the dark with clarity and precision thanks to ATN's NVB5X-3 Night Vision Binocular. These binoculars bring you 5x magnification using all glass optics multicoated in proshield. NVB5X-3 is rugged to match your environment, and features weatherproofing that resists water and fog, and can withstand a wide range of temperature. The long range infrared illuminator is detachable and gives you accurate distance vision in total darkness. This night vision scope from ATN includes automatic brightness control and cut-off, along with digital controls. NVB5X-3 is a third generation model that runs on a single AA or CR123A battery for a life of 50 hours (17 hours if running with the IR illuminator). ATN also offers a limited two year warranty for this binocular. 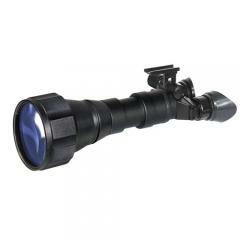 Dimensions: 288 x 108 x 102mm / 11.3" x 4.3" x 4.0"
©2002-2019 CopsPlus.com: ATN NVBNB05X30 NVB5X-3 Night Vision Binocular FREE SHIPPING!